Aloo Shimla Mirch Sabzi aka Potato Capsicum Masala is a flavourful classic Indian dish; simple and satisfying Potato curry for weekday dinners. Potatoes are so versatile- it can be roasted, curried, fried, mashed – and yet the humble Potato never fails to impress you! Potato and Capsicum is an amazing combination, perfect with just the right amount of spices and amazing flavours. Serve this Aloo Shimla Mirch Masala with Rotis or Naan. You can also try this Potato Masala with Pooris instead of the usual Aloo Bhaji. Even though Aloo Shimla Mirch Sabzi is a simple dish, it is very healthy and is great for office/ school lunch pack. I first tried this recipe when my colleague, Zubairji (whose wife is a great cook) brought this to office. We loved the unique flavours and crunchy bell peppers. Although I had doubts about combining Potato and Capsicum., it soon vanished when I tasted it. Dry version is known as Aloo Shimla Mirch Sookha Sabzi. If you are a Potato lover, you will enjoy my Potato recipes like Aloo Gobi Masala, Cauliflower Mappas, Potato Stew, Pav Bhaji, Aloo Paratha, Egg Curry with Potatoes, Nadan Chicken curry with Potatoes, Chicken Roast with fried Potatoes, Kerala Beef stew, Mutton Stew, Baked chicken and Potatoes etc. Bell Pepper/ Shimla Mirch has amazing health benefits and is considered good for your health, skin and hair. Rich in Vitamin A, C and beta-carotene, it is good for healthy eyes. With many anti-oxidants and anti-inflammatory nutrients, it has anti-cancer properties too. It is also rich in Magnesium, Pottassium which are essential minerals. Vitamin C in Capsicum helps to absorb Iron. I love this colorful, crunchy vegetable and generously add in most of my dishes like Mushroom Capsicum Pepper fry, Stir fried Beef with Mushroom, Paneer Puffs, Mushroom Kadai, Chinese Fish, Kadai Chicken, Chilli Pork, Chilli Chicken, Soya Manchurian, Chilli Idli, Paneer Chilly, Gobi Manchurian, Pizza Dosa and all my Pizzas, fried rice, Noodles– indeed a non-ending list!! Cubed Potato and Bell Peppers are tossed in a special blend of spices to make this Aloo Shimla Mirch Masala. However, in some areas, Onion and garlic are avoided. You can serve this Aloo Shimla Mirch Sabzi as a side dish with Rotis, together with little curd for a balanced healthy meal. 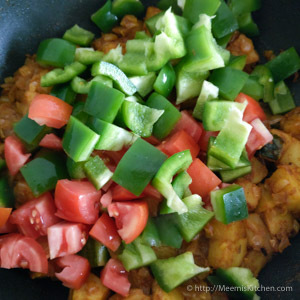 Without further ado, here is the wonderful Aloo Shimla Mirch Sabzi recipe. Enjoy! Capsicum/ Bell Pepper : 2 nos. Peel and cube the Potatoes. Cut Capsicum and tomato into cubes and keep aside. 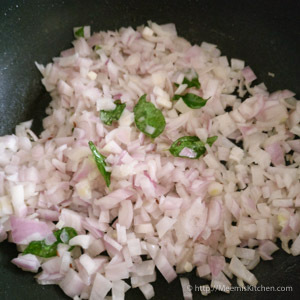 Dice the onions coarsely into small squares. 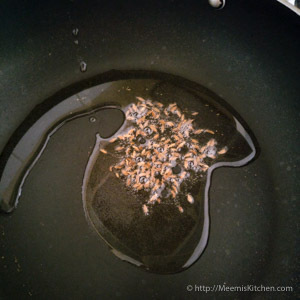 Heat Oil in a pan (you can use any vegetable oil, I used Sunflower oil). Crackle the whole cumin/ Jeera and add curry leaves. Next, add the diced onions and fry till slightly opaque. 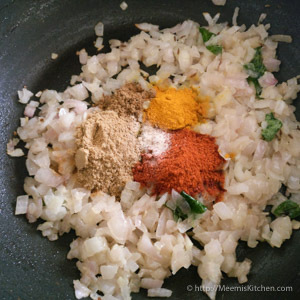 Now, add Coriander Powder, Chilli Powder, Turmeric Powder, Garam Masala and Hing/ Asafoetida. Fry for a minute and add cubed Potatoes and salt. Stir fry for few seconds, cover and cook, stirring in between. If required, add 2 tbsp water to cook the potatoes. 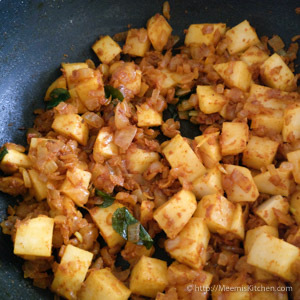 Once the potatoes are almost cooked, add the cubed Capsicum and Tomatoes and a pinch of Methi leaves. Combine well and cover and cook till the potatoes are tender and soft and the tomatoes are slightly mashed. Sprinkle a pinch of Chat Masala and chopped coriander leaves. Mix and transfer to a serving plate and enjoy it hot with Rotis, Naan or Pooris. You can add more capsicum or Potato in the recipe to suit your taste. Please adjust the spices according to your taste. I have used whole Cumin/ Jeera in the recipe, instead you can add cumin Powder along with other spices. Capsicum should not be overcooked. The crunchy Bell Pepper in the Masala makes it more appealing. Although, water is not necessary for Potato Bell Pepper Masala, you can add little water to cook the Potatoes to avoid sticking. 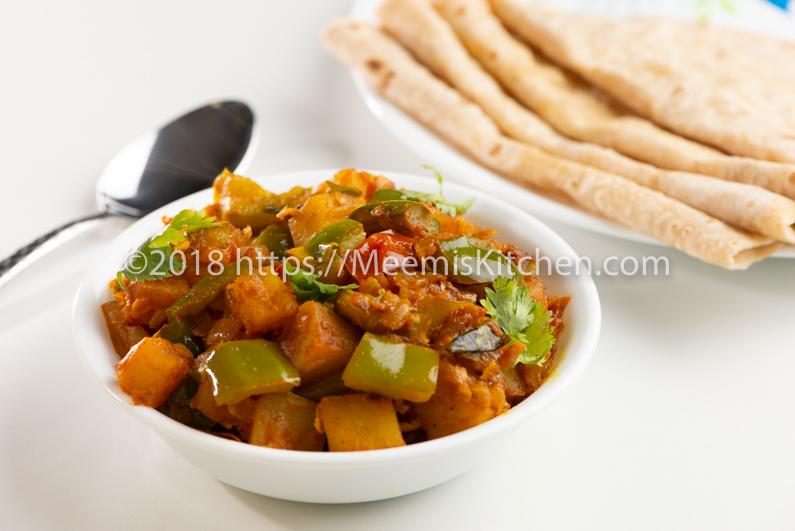 If you like this simple dish of Aloo Shimla Mirchi, please try and let me know through comments or share with your friends using the share buttons on the side. It would really motivate me. God Bless!! Thank you Roshin, it is a great recipe, one of my personal favourite veg. recipe. Thank you for trying and for letting me know. Keep visiting. I hope to look up other recipes on your blog. I’m an amateur at cooking being a working woman turned home maker. I’m usually at a loss when it comes to churning out a side dish for chapatti. The above dish I first had at a restaurant here and tried once but it suggested that I sauté the capsicum first separately. Yours is convenient! Thank you Roshin. It can be cooked separately, but I like the flavours of capsicum in the gravy, so adapted it to my taste. Please do try other recipes and I look forward to hear from you. God bless!